Rep. Scanlon and state Comptroller Kevin Lembo seek transparency in drug pricing. “Prescription drug costs are the fastest rising cost in health care and consumers are rarely given an explanation when the costs of their drugs increase,” Representative Sean Scanlon, the House chairman of the legislature’s Insurance and Real Estate Committee, told a press conference in Hartford. Scanlon and state Comptroller Kevin Lembo announced legislation that for the first time creates transparency for pharmaceutical drug pricing in Connecticut. 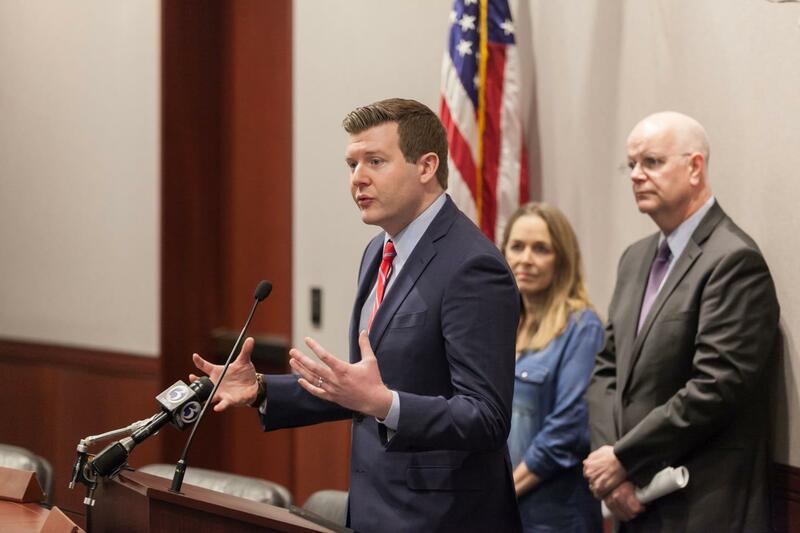 “Under this legislation, we will finally get our constituents the answers they deserve and dig deeper into what’s happening with drug prices so we can ultimately lower health care costs for Connecticut seniors and families,” Scanlon said. House Bill 5384, An Act Concerning Prescription Drug Costs, would trigger a state review when drug prices soar beyond a reasonable threshold, and it would require disclosure of essential information about rebates and deals between drug manufacturers and pharmacy benefit managers to ensure that consumers get relief at the pharmacy counter. When a drug price increases beyond a 25-percent threshold, the Office of Health Strategy will have the authority to request a justification for that increase from the drug manufacturer, including details about research and development and related expenses. Ideally, this measure would eventually be expanded to include disclosure about drug manufacturers’ marketing expenses as well. Any PBM registered to operate in Connecticut must disclose the total amount of rebates received from manufacturers, including how much of the rebate the PBM retained vs. how much was passed down to plan sponsors and consumers. They must also report their administrative fees, including any other payments by the manufacturer to the PBM that are not considered rebates. Consumers would get immediate relief at the pharmacy counter -- paying post-rebate costs instead of a drug’s list price.